Welcome back everybody. I hope that you found the first morning session informative and interesting. 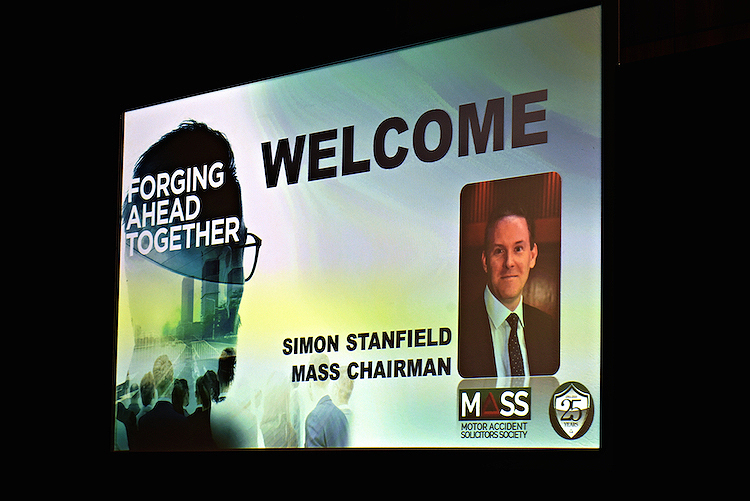 I’m delighted to speak to this conference today on my first occasion as the Chair of MASS. I’m particularly pleased to be doing so on the 25th anniversary of MASS and we’ve already heard from Janet Tilley on the fantastic work that MASS has done over the last quarter century. I hope to be able to follow in the best traditions of previous MASS Chairs in defending the rights of motor accident victims to affordable, independent and professional legal advice. As we all know, the principle of affordable, independent and professional legal advice available to all is under pressure across the legal sector from a range of directions. The motor accident sector has had to contend with a great deal of change in recent years and there is little sign of this pace of change abating. We could … possibly … be expecting the Ministry of Justice’s plans for claimants and accident victims any time now. My immediate fear until starting to speak to you was that it might even have been published this morning. Which might have caused one or two problems. Back in October, if only for a few short hours, it was hoped that MoJ had seen sense and had put its proposals to one side, perhaps for a re-think. Regrettably this doesn’t appear to the case. LASPO and the introduction of MedCo suffered from not actively taking on board advice from those who deal with claims every working day and for being flawed in their delivery. The Government’s proposed limitations and possible banning of claims are about to make all the same mistakes. It is an agenda being pursued without adequate research or scrutiny of the possible consequences. It will supposedly assign everyone who makes a claim as either fraudulent, frivolous or an unnecessary expense, regardless of the circumstances of the claim, irrespective of fault or no-fault, injury or non-injury. The relentless narrative of the last few years – compensation culture, cash-for-crash, ambulance-chasing lawyers – has undoubtedly left an impression with Government. Much of it is wrong and misperceived. It is more than possible that such headlines have themselves contributed to a culture where otherwise law-abiding citizens have been tempted to make a claim for an injury they did not receive or exaggerate the impact of an accident they were involved in. We all agree that fraud has blighted the sector for too long and must be tackled with all our energies. Action to target fraud must not, however, affect how an accident victim is treated. It must not affect their basic right to seek recompense for injuries sustained through no fault of their own. We won’t know for sure what the Government is proposing until it is published. But if they intend to abolish the right to damages caused by someone else’s negligence to save costs for the insurance sector, this would run contrary to any meaningful definition of justice. It would potentially introduce legal absurdities. Potentially, a pedestrian struck by a motor vehicle would be entitled to claim compensation for soft tissue injuries. But a driver of a vehicle struck from behind by somebody recklessly exceeding the speed limit would not. Someone on the street hit by a car and you can claim. Sitting inside and hit by another car you could not. These are the dangers of threatening to introduce proposals that refuses to compensate for some types of legitimate claims, but not others. It threatens the very principles of our insurance and justice system. To effectively outlaw the majority of claims, however legitimate, is nothing short of judicial vandalism that rides roughshod over hundreds of years of legal tradition. The whole claims sector – insurers, defendant or claimant solicitors – surely want the same thing. It wants to look after the interests of the majority who are legitimately seeking justice after misfortune has struck. A majority that have by the way paid their compulsory motor insurance in the expectation that they will be recompensed. Introducing a regulatory regime where the just majority are penalised for the actions of the unjust minority is surely not the right way to tackle the problem. The Government and insurers say that they wish to reduce further the number of claims and the associated costs. If anything, the proposed regime could lead to an increase in costs. With claims value rising to mitigate contingency arrangements. The number of claims may increase as well, together with the levels of fraud. We could all suffer from more cold-calling and other unwanted marketing communications, right at the time when complaints about PI cold calls has started to fall. It has been shown before that free of the level of regulation that solicitors operate under, CMCs will adapt their business models. Under the system proposed they will potentially flourish, exploiting loopholes whilst stepping over the debris of a crippled legal sector. Open the Portal to allow Litigants in Person to use it – and struggling with the complexities of representing themselves – many will likely fall prey to CMCs. They will helpfully direct clients on how to use it, taking an even larger slice of damages away from the accident victim. Have we learned nothing from how the PPI market operated? Tragically, but inevitably, some accident victims will likely not seek compensation for their injuries at all, but the costs will be borne by us all through the NHS. A dysfunctional market benefits no-one in the sector. The facts do not provide the evidence for the proposed actions. Motor PI and whiplash claims have fallen by 70,000 claims a year since their peak in 2011-12, having progressively fallen for four years in a row. The number of claims per year was falling even before LASPO was implemented in April 2013. Serious road traffic accidents reported to the police have fallen in recent years, but the Department of Transport still estimates that there were in the region of 630,000 “slightly injured” in 2015. Of these 630,000, the Department of Transport estimates that 519,000 casualties from motor accidents were unreported. We all welcome the fall in the number of deaths and serious accidents on our roads. MASS has campaigned for many years to make our roads safer. But let us not hear any more of the nonsense about all accidents being reported to the police. On costs, the ABI’s own unpublished figures reveal that claims costs have fallen 29% since 2010. The amount paid out annually by motor insurers has fallen from £8.3 billion in 2010 to £5.89 billion in 2014 – a decrease and saving to insurers of £2.41 billion. Damages have not increased proportionally as fast as the proposed new small claims limit. Damages awarded today may be the same or less than awards made in the early 1990s. No-one, claimant or insurer, has produced a figure for fraud higher than 11%. Solicitors contend that the level of fraud is more like 1-3%. Whatever the true level, and we can argue about the correct level until we’re all blue in the face, one aspect of this debate is unquestionable. There is unanimous agreement that the vast majority of claims are legitimate. Insurer fraud figures combine both proven and what it calls “suspected” fraud, based on a number of highly questionable criteria. When the figures are separated, the incidence of proven fraud drops to 0.2% of all motor claims of which only some will be for whiplash or other soft-tissue injuries. We urgently need to seek agreement across the sector about what does and does not constitute “suspected” fraud. Until there is a uniform definition agreed by all, “suspected” fraud figures will continue to be viewed suspiciously by the legal sector. Even if insurers did reduce motor premiums for a short period after LASPO, there is little doubt that premiums have risen again dramatically in recent years. The insurance cycle turns. They have passed on the recent Insurance Premium Tax increases. Wider costs in credit hire, garages and elsewhere all continue to rise. Blaming rising legal costs, when all the evidence points to the contrary, will not wash. There will always be a new excuse for maintaining or raising motor insurance premiums to protect insurers profits. With no mechanism to force insurers to pass on the supposed savings from reduced motor insurance premiums to consumers, public promises should at best be treated with scepticism. It is not too late though. It is not too late for the Government to see sense. To see the dangers ahead. The legal sector must accept that there will be change. But that change can be more sensible. More targeted. And certainly more effective. It is not too late to develop an alternative approach. One that tackles some of the many problems that exist in the sector. An approach without the known and unknown unintended consequences attached to the Government’s position. There are many good ideas recommended by the Insurance Fraud Taskforce, although the Government needs to take a more proactive role in driving through their delivery by formalising the legacy vehicle. The industry can only do so much and still needs the Ministry of Justice to encourage, drive and if necessary cajole the sector into action. The recent structural changes to the MedCo system need time to bed in. There continues to be the opportunity to develop the Portal further, with discussion and agreement, improving the data provided to the Insurance Fraud Bureau. There are discussions to be had around the notification of claims and the input of information around the source of claims. But it is not all down to the legal sector. Insurers need to actively address the issue of pre-med offers. A voluntary approach of encouragement has shown to be insufficient. Insurers also need to take robust position on claims they believe to be fraudulent rather than settling because it is cheaper than fighting them in the courts. Together we can explore opportunities to extend data sharing, building on the early successes of askCUEPI, a MASS-led initiative. There is a genuine debate to be had about what level the small claims limit should be set at in relation to the current market. And what would be proportionate to the growth in damages since it was introduced. A year ago my predecessor called for a blanket ban on cold calls and texts. Today I repeat that call. Although solicitors are not allowed to make cold calls themselves, those CMCs and marketing companies that do cast a stain upon the whole PI sector. It is time for the Government to act. It has been a hard and bumpy journey, but we have already come a long way in reforming the claims market in the last few years. The MoJ Portal and fixed costs, further reduced fixed costs through LASPO including a ban on referral fees, the end of recovery of ATE Premiums and success fees, AskCUEPI and MedCo. Solicitors have not always agreed with every measure, and particularly the way in which they have been implemented. But we generally have a more efficient and streamlined claims process now as a result. Far from building upon this progress, the Government’s proposals would re-open the market to abuse and ultimately let down the accident victims that most need the system to work effectively for them. When the dust has settled on the current debate, the reality is that there will still be hundreds of thousands of claims. This is for the simple reason that there will continue to be hundreds of thousands of motor vehicle accidents in the UK, beyond whatever the Government seeks to do. If the proponents of the reforms win the day, the market will adapt to pursue these claims. But if we lose, it will likely be CMCs and others who represent many claimants, rather than independent, legal professionals. Past cross-industry initiatives have demonstrated that so much more can be achieved by an open dialogue to find real solutions. 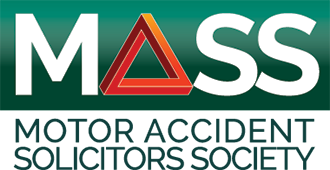 MASS has, and will, always stand willing to engage where that is the best option for the victims of motor accidents. Insurers and solicitors will not agree on some things, but I’m sure there is much that we can. We need to work together to shape the claims landscape in a way that is fair, legitimate and affordable. Whether we deal with victims, claimants or customers, we owe it to them to try. I hope that we can begin exploring some of these issues today in the next couple of sessions. I hope that you find today’s conference informative and engaging – and that you’ll have lots to say to our various speakers. Thank you.